10 tracks - playing time: 44:00 min. Now this is a weird band; in the biography Asmodeus X present themselves as influenced by acts as diverse as Joy Division, Immortal and Laibach. Their music has also been described as industrial, electronic black metal and even neo-classical. Now, I don’t know much about the music-scene in the States, but in Europe we call this E-B-M. Electronic-Body-Music. Aggressive EBM, though. And indeed, after a couple of spins it’s possible to spot leaks of a later Ministry, NIN ("Mandatory Sacrifice") or some Kraftwerk in their songs. Leaves me with the question of where to place Immortal? This album, "Wolf Age", is the result of a near-death of the band members when travelling home after touring the West Coast. According to their own words, their emotions were distilled in the recording session of "Wolf Age". And these ten songs aren’t bad at all; regarding this is the first album of Asmodeus X. The music, a modern performance of danceable EBM with aggressive vocals and a good attempt to sound desperate and even a bit `evil`, is catchy and offers a bit more than the Covenants of this world. 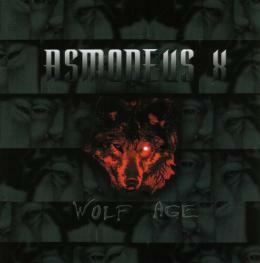 So, if you’re into Kraftwerk or Joy Division and wonder what American EBM sounds like, Asmodeus X is a good starting point.